Donald Harley McMurtrie, 92, Wausau, passed away peacefully, surrounded by his family, Thursday, January 24, 2019 under the care of St. Clare’s Hospital, Weston. Don was born May 15, 1926 in West Allis, WI, son of the late Herbert Allen and Mabel Helen McMurtrie and was a fourth generation Scot. His ancestral family emigrated in 1884 from Kirkmichael, Scotland to New York, later moving to Racine, WI. Don’s greatest devotion was to his family. He was the patriarch of 10 children, who remember their dad for his numerous pan-fishing trips, camping excursions, and frequent visits to Menard's. He was always looking out for his children, assuring their engine oil is changed, teaching them to be self-reliant, and imparting valuable life skills. 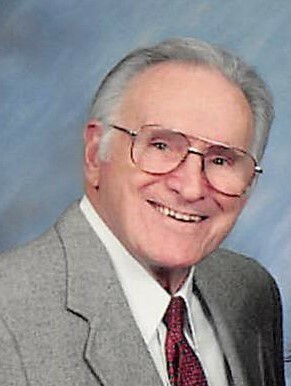 Throughout his life, he modeled honesty and a moral compass for his children. Don lived life to the fullest. He was a dreamer and an innovator, who refused to allow circumstances stifle his entrepreneurial and independent spirit. He and his only sister Dorothy were children of the Great Depression – when entertainment was listening to the radio through the neighbors’ open window and health care meant sutures without expensive anesthetic. But Don rose from extreme poverty with distinction. He used his business acumen to build several successful ventures that would rocket him to the elite class. The first was a simple egg delivery business. With a borrowed truck and no capital, Don built a simple, yet strong business. He had an eye for seeing unmet needs no one else knew existed until Don had already generated a successful solution. His ideas were simple, yet revolutionary. Despite a modest eighth grade education, Don would continue to meet needs of his community with intelligence, ingenuity, and sheer willpower. After moving to Wausau initially to begin a job as a safety engineer for an insurance company, Don saw an opportunity in the nursing home industry. He challenged the status quo and developed new designs and innovative processes that would lead to changes in industry standards. He built, owned, and managed Wausau Colonial Manor (now named The Bay at Colonial Manor) and Superior Nursing Home with locations in Antigo. He also pioneered many construction projects, briefly ran an ice cream shop with his wife and family working the helm, and finally began a trucking business in his late 70s. Don’s career and personal interests were often interwoven, he pursued what he loved and often found a way to monetize his adventurous spirit. One of his great passions was piloting his own small aircraft. He flew throughout Canada and the United States for work and leisure – once flying underneath the St. Louis Arch. Even at the age of 89, Don was able to maneuver three complete takeoff and landings witnessed by his safety pilot, who earned a promised $100 bonus if he would allow Don to land the plane at least twice without the safety pilot touching the controls. For Don, flight was a love that endured multiple plane crashes due to mechanical failure. Don survived his first plane crash from an engine failure after taking off at Flying Cloud Field. Don initiated another emergency landing on a Canadian road – the only casualty being a single mailbox. Don was a man in search of adventure and was very proud of taking down a charging grizzly bear while on a hunt in Alaska. He loved to tinker and design in the workshop and build various woodworking projects for work and family. Those who know Don will remember him being a connoisseur of unique, odd and sometimes, stinky food combinations; Limburger, Braunschweiger and onions just to name a few. Don was as a driven spirit – maybe even a little rebellious. When World War II broke out, he traveled to continually challenge his 4F status. He was desperate to hide the shoulder and lung conditions that prevented him from fighting for his country alongside his peers. Throughout his life, Don remained a fierce patriot, but also a dedicated family man. The family would like to thank the loving staff at Pride TLC Assisted Living, Weston, which was Don’s home during his final few years, as well as the compassionate and skilled medical staff at St. Clare’s Hospital, Weston. As a young man Don married Jeanette Blasius, with whom he raised three children before she passed away in 1967. Later he married Carol Gollubske (deceased) and adopted her three children, Steve, Jonathon, and Mark. In 1979, Don married Patricia McMurtrie (Coleman) and lovingly raised seven children. Don was the patriarch of a large family to include ten loving children, Lynn (Peter) Kruit, Jon (Nancy) McMurtrie, Julie McMurtrie, Becky (Hezekiah) McMurtrie-Baker, Faith (Eric) Thomas, Bitsy (Trevor) McMurtrie, D.J. (Marcee) McMurtrie, Cassie (Larry) Ruffi, Grace (Wyatt) Harper, Thomas (Emily) McMurtrie. He lit up whenever seeing one of his 38 grandchildren and 29 great-grandchildren. Don will also be missed by numerous other family and friends. He was preceded in death by his parents, Herbert and Mabel and his dear sister Dorothy (Ken) Hanson. He was also preceded in death by his wife Jeanette McMurtrie. Visitation will be held at Wausau Bible Church (1300 Grand Ave, Wausau, WI) at 11:30 AM on Friday, February 1, followed by a service at 12:30 PM and light refreshments. Don requested that friends and family wear color to celebrate his vibrant life. He will be laid to rest in a private ceremony at Gate of Heaven Cemetery in Rothschild, WI. In lieu of flowers, please send memorials to the Navy-Marine Corps Relief Society or the Army Emergency Relief Fund.